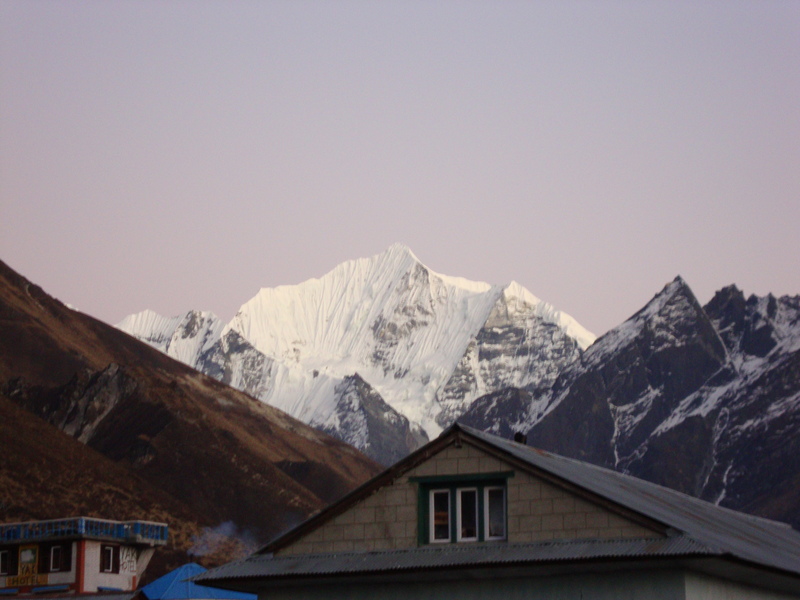 We are in Pahare, now just a couple of miles away from Syaphrubesi – the beginning and end point of our winter expedition on the previously unclimbed Mount Ganchenpo. ‘Shall we stop for tea?’ Dorje, the expedition leader and my chief ‘baby-sitter’, asks, grinding to a halt by one of the village lodges. ‘Sure,’ I reply, out of breath after two weeks of ceaseless trekking and climbing. Dorje, Pasang, who was responsible for the technical side of our mountaineering adventure, and I sit down at one of the tables. It is still early in the morning and our cups of steaming-hot black tea provide a pleasant contrast to the cold air. My boys continue their interrupted conversation in Sherpa language while I look around, letting my eyes rest on a stall which belongs to the lodge below the one where we are having tea: the stall is covered with woollen hats and scarves, khukri knives, bracelets and necklaces. A pale-skinned woman with a long ponytail of blond hair is standing over this colourful collection of things playing with a small dagger. She has an unhappy face: her lips are pressed tightly together, their corners curling downwards, and the expression in her eyes is this of hopelessness and impatience. Looking up to where I am seated, she appears not to see me, her gaze clouded with doubts. Suddenly, a voice calls her away and, putting the dagger back on the stall and her backpack – on her shoulders, she quickly walks past me on her way up towards Lama Hotel. She is me two weeks earlier, at the beginning of the expedition. I want to run after her and tell her to smile because she will succeed in getting to the top of the unclimbed Ganchenpo – but I can’t – it’s against the rules of the time game – and so she is gone, taking her burden of uncertainty with her. ‘Just another hour and we’re in Syaphrubesi, and tomorrow – Kathmandu.’ Dorje announces finishing his tea. ‘Excellent,’ I say, my eyes still following the shadow of my past up the trail. She has a long way to go before she knows what I already know; while my journey in Langtang is now over, hers is only just beginning. Happy New Year, Carl! Lots of love and big hug from Kathmandu :)! I so enjoy the way you weave a story together…have a wonderful new year filled with all that you seek. Thank you very much indeed! Have a wonderful and inspired New Year, too )! Just to wish you a happy and safe New Year, always thinking of you and hope all your dreams and aspirations come good for you in 2012. My darlings, thank you! Great to hear rom you again! All the very best to your wonderful family in the New Year! Hope we can meet again in 2012 for some warm brownies with ice-cream ;). Will look forward to it as always your company is welcome anytime anywhere. I take it you did it !!!!!!!!!!! Is it my company, though, or this of brownies and ice-cream :)? And yes, we did it – I’m writing about the climb now and will post the whole story within the next week, I think. Lots of love to you and Gill, keep in touch! Gill alredy new you did it by reading your first story and can’t believe the amazing time you must have had getting there,she asks what flag did you put on top? Your just amazing and we love you dearly and are so proud of you. Hugs from us both. You two are just wonderful :)! Thank you for keeping me in your thoughts and in your hearts – it counts, it really does!